Hazel, What’s With the Retro Name? Best known for There’s a Hippopotamus on Our Roof Eating Cake, which was recently translated into Chinese, Hazel Edwards writes across media, for adults and children. Pocket Bonfire Production’s Hippo film premiered at St Kilda Film festival for the 30th anniversary, and is screening internationally at Edinburgh Film Festival and beyond. 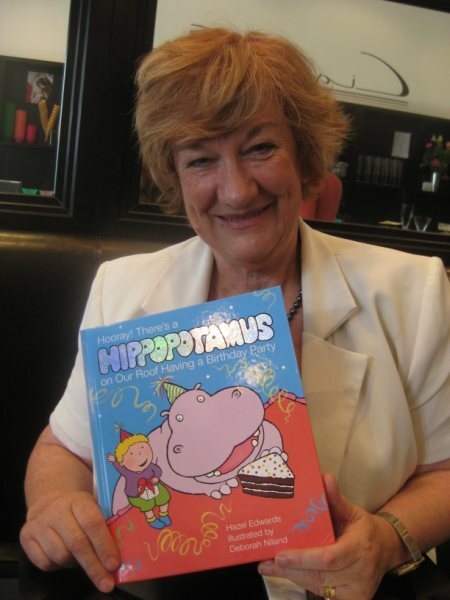 As ambassador, Hazel is involved with the 2012 National Year of Reading, and the Victorian Premier’s Reading Challenge.Hazel has two grandsons, for whom she writes stories each birthday. Her latest books include ‘Sir Edward ‘Weary Dunlop’ (Aussie Heroes series) and ‘f2m:the boy within. Until now, I’ve been in a fairly select name grouping. Ex-PM’s wife Hazel Hawke and I have been a minority with the name Hazel. But there are a couple of other authors called Hazel Edwards; one writes Mills & Boon romance novels, and another is an English historian. There’s also a Hazel Edwards’ gravestone image on Google. And I’ve been “dead” a couple of times. “…Hazel is retro by at least a couple of generations. The world stopped having Hazels around the time it stopped having Berthas and Gladyses and Mildreds. The last time Hazel was heard from was 1961, when Shirley Booth played a busybody maid of that name in a sitcom of that name, based on a cartoon strip of that name. Phinnaeus is even more retro, as in Old Testament retro, and more obscure than such OT running mates as Methuselah and Obadiah. I’ve never thought of myself as retro nor a celebrity. I was named after my mother who was Hazel Grace, but known as Grace. My father suggested they use one of her names for their only daughter, so I became Hazel. That was lucky because I’m NOT graceful but neither was my mother. Names are not always accurate. As a children’s author, I’m conscious of names for my characters, and tend to choose either symbolic ones, or those which are common with the age group and that they can pronounce. Ironically, Grace is the most popular girls’ name with the under-fives. My Hand Me Down Hippo character called Mini was illustrated by Mini Goss, who has a young daughter called Hazel, so that’s another coincidence and a “young” Hazel. My neighbour alerted me to the Happy Hazel Society which meets annually at Hervey Bay, and these Hazels are mainly in their 70s, married to Rons, and sing I’m a Happy Hazel to the tune of I’m a Little Teapot. I don’t fit that group either, nor the shortened version Haze which sounds like a fog. My husband Garnet is named after an uncle, and his name is a semi precious stone. Recently I spoke with a dentist mother of five daughters who had named each after a stone, and intended giving the appropriate jewel on each daughter’s 21st birthday. Garnet was one of her daughters. Opal, Ruby, Emerald and Topaz were the others. Being given hazelnuts on a significant birthday doesn’t have quite the same flair. Also it was pointed out that Garnet and Hazel were both colours, a fact which had escaped us for decades. I’ve always loved the name Quentin, but my husband doesn’t agree, so my character “Bad Luck Quentin” scored that one. It was a trade-off so our daughter would NOT be called Brunhilda after Wagner’s opera. But our son gained the real middle name Quest. While I was a guest on ABC National talkback on the ‘Hazel’ issue of names, a caller rang with the following anecdote. At the christening, the Irish priest asked the parents for the baby’s name. In the newspaper babies’ names of 2005, Hazel was very popular and grouped with other colours like Ruby and Scarlet. I didn’t anticipate that. In 2007, my mature aged College of Advanced Education students “exies” gave me a “Hazelnuts Roast” which was a satirical afternoon of fun, the name taken from an earlier student publication, A Bunch of Hazelnuts. We drank hazelnut coffee. My view is that you should ‘lease’ your parent- given name until 21, and then be allowed to trade it in for your own choice. But after 21, that would be your label for life. But I do have a shared pseudonym, A.K. Aye, for crime writing. I was born in1945 and I was christened Hazel Joy. I did not come into contact with anyone with the name Hazel at school but I have always loved the name. I was thrilled when my granddaughter was named Dulcie Hazel Rose after me. my baby girl, born in Aug of 2011, is named Hazel Grace. Named for her great, great grandmother Cora Hazel. Cora Hazel is absolutely stunning, and Hazel Grace is very pretty too. My beautiful baby girl, born September 2010 is Hazel Grace, named after her great grandmother. Everyone finds her name unique and delightful….and the name suits her quite well! I’m not at all surprised; it’s a lovely name, and coming back into fashion, steadily rising up the popularity charts. Nice to hear from another Hazel but there are more of around than you think. In my year at high school there was another Hazel (with the unfortunate surname of Bush), my sister’s high school best friend was a Hazel and my husband’s best friend’s long-term partner is also called Hazel. We’re all born between 1974 and 1979. Also, don’t forget Hazel O’Connor, Hazel-Rah from Watership Down and Hazel McWitch from Rentaghost. What lovely names!, Here in Pom-land, I know more than one little girl called Hazel at the present time. The Hazel was one of the most sacred trees of the ancient Celts – and it was punishable by death to cut down a Hazel in Ireland in medieval times. Hazelnuts were strongly associated with wisdom – the salmon of wisdom in Connla’s Well used to feed on hazelnuts. I also love the jewel names. Topaz immediately brings to mind one of my favourite literary characters, the ethereal Topaz Mortmain in I Capture the Castle. And I think Quest is marvellous – you’ll be pleased (I hope!) to know it’s in my book! And I totally agree with your idea for leasing your parent-given name until 21 — if only that were the norm! Thank you so much for graciously agreeing to be a guest blogger, Hazel! Every name has a story, and yours is very interesting. Garnet and Hazel are lovely names for a couple; they seem almost like something that would be in a novel.